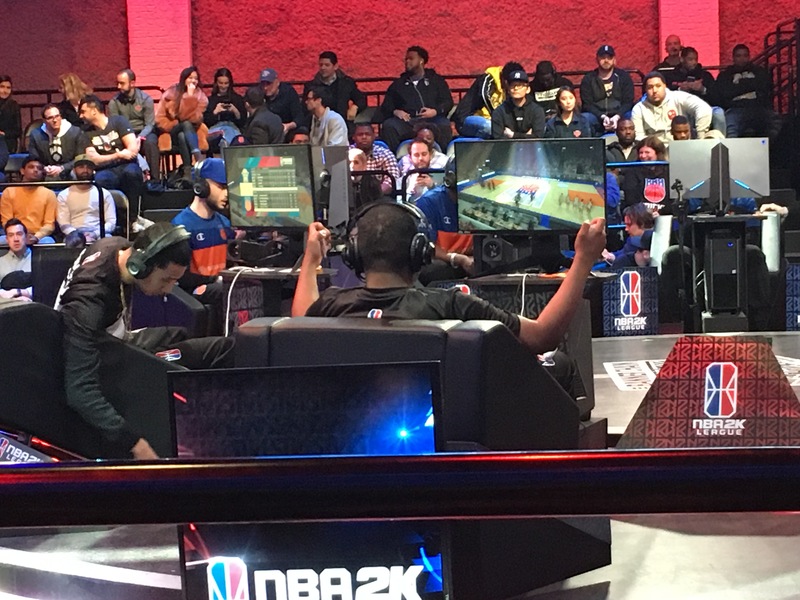 Two teams—Raptors Uprising GC and Magic Gaming—have qualified for the knockout round of the 2019 NBA 2K League Tipoff tournament. But the season is just beginning for all six teams who played on day one. Teams went 1-3 on back-to-backs, losing by an average of 10 points, as only Magic Gaming escaped the back-to-back curse. With the emotional energy each team expends on each game, the second half of back-to-backs look to be a challenge for teams throughout the tournament. The eight-point system is interesting, to say the least. Three-team groups complicate matters, but the point system was not sufficiently acknowledged to make it clear. The Raptors, and then especially the Nets, spent their time tallying up quarter margins that were insufficiently represented live in-studio. One nice subtle change from the studio: players now sit across from their positional opposites. Point guards are next to each other at one end, and centers at the other. Last year, each team’s point guard sat, in effect, next to the opponent’s center. This will make for better trash talking when a player is in particularly fine form against their matchup. Four coaches made their debut on opening night. LT Fairley and Mavs Gaming bowed out in round one, as did MPBA counterpart Ivan Curtiss and Nets GC. Austin Peterson coached his first NBA 2K League game as well, helming Cavs Legion GC in its two-game split. Peterson, a video coordinator for the Canton Charge, was watching gamefilm thirty minutes after the team’s tournament run ended. Jonah Edwards made his debut for Magic Gaming after coaching Mavs Gaming last year; he’s currently the only coach to have made it out of his Tipoff group two years in a row. Scoring is down from last year. Only one team (Raptors Uprising) topped 60 points in regulation, in its opening 62-41 win, and only Dimez scored 20 points in 4 quarters (four players crossed the 20-point threshold in the 2OT Magic-Knicks game). Any player who can consistently average 20-22 points per game looks likely to have the inside track at the MVP award, unless a mid-season patch shakes things up a bit. Magic Gaming was the lone team to go 2-0 on the night and advance to the quarterfinals by virtue of their winning percentage. In game one, they beat the Nets 50-42 as KingCamRoyalty, last year’s sixth-round pick, hauled in 19 boards. He replicated the feat in the subsequent game, a 2OT 72-70 win over Knicks Gaming, with yet another 19-board effort. KelMav, the team’s third-round pick, provided a particularly vocal performance. After scoring 11 points against the Nets, he poured in 20—including the game-winning dunk with 0.5 seconds to play—and added 7 assists in the group-clinching win over the Knicks. Reizey, the Magic’s first-round pick, played point guard. While he didn’t have the best day, shooting just 5-24 from the field and 4-14 from beyond the arc, he held the team together at point guard, a relatively new position to him. Historically, he’s an incredible shooter from anywhere on the floor; once he gets going, the team will be all the more lethal. Last season, Magic Gaming found itself placed in the Tipoff’s group of death, with eventual champions 76ers GC, runner-up Blazer5 Gaming, and Raptors Uprising GC. They went 0-3. This year, they emerge from group play unscathed, as new head coach Jonah Edwards promised Magic Gaming Director Ryan DeVos. The Magic were helped on their way by the contributions of 2018 protected player UCManny, playing the lock at shooting guard. The former second-round pick chipped in 11 points and 4 steals in the team’s opening win before scoring a team-high 25 points in the win over the Knicks. Raptors Uprising was the lone team from day one to run double lockdown defenders. Doza, the team’s first-round pick, played on a sharpshooting playmaker at point guard, averaging 11 points and 9.5 assists per game. Second-round pick Slim (SG) and protected player Kenny (SF) both played on lockdown builds; Slim averaged 5 steals per game, while Kenny led the team with 16 points per game. All Hail Trey and KingQuai614 manned the frontcourt, like last season, and Trey averaged 14 points while KingQuai grabbed 13 rebounds per game. The Mavs looked rattled in their first game, an opening-day beatdown at the hands of the Raptors, but refocused and put together a good effort to beat Cavs Legion GC 53-43. To no one’s surprise, they ran Dimez at point guard, and he responded, especially in the second game, with 18 points in the first half (20 overall). I still think he can be too prone to getting caught without his dribble in the midrange, but he proved in game two that he’s still an elite guard. The rookies played like rookies. Sherm went from unnerved in the first game to collected by the second. Mo had a tough first day, playing small forward; when the shooting stabilizes he’ll be fine. Pete came on very strong in his second game, posting a 12-point, 14-rebound double-double. Larry is back in full force, with a vociferous rooting section supporting him. He played well in both games, aggressively and easily, and the Cavs did a good job to go out and acquire him (via trade with T-Wolves Gaming). His hopstep jam was easily one of the highlights of the night. Power forward is an underrated position this season, and if the Cavs can overmatch opponents by playing Larry at that spot, they’ll be in a very good position. The Knicks will take their championship rings over a berth in the quarterfinals, but they looked rusty on opening day. iamadamthe1st eked out just two points in the opening, high-stakes game against the Nets; he looked better in game two, but point guards need to be able to draw the attention of opposing locks on every possession or at least capitalize on defensive mismatches. Malik can shoot; Goofy will shoot (13/13 in the 2OT loss to Magic Gaming). Finding the proper balance in touches for the Knicks, who also have Idris at power forward, will make all the difference for the 2018 champions. Nets GC showed that it has the chemistry it touted all offseason. That translated to a momentous win over the Knicks and a tough loss to the energetic Magic. They benched second-round pick Shuttles as the score-first wing iiTz Chas played at the shot-creating sharpshooter. Wavy played like a rookie point guard—a good rookie point guard—while NateKahl and Shockey looked like the smart, seasoned veterans they are. JoelLazu at power forward is interesting, and could be something special if he finds a consistent shot. Raptors Uprising ran double locks with second-round pick Slim at shooting guard and Kenny at small forward. The double-lock move is an interesting one. When the Raptors were on, as they were against the Mavs, they presented a fearsome defense with enough offense and rebounding to support their defensive identity. But the double-lock system may fall prey to the same fatal flaws to which last year’s shot-creating slasher succumbed. If a team using double locks falls seriously behind, it will most likely struggle to catch up due to a lack of offense. That was the case for the Uprising on day one. Doza may prove more efficient offensively (though a good night overall, he shot 8-21 from the field), the Raptors have to manufacture more 3-pointers to make their system work in the long run. Most teams are finding success running a lock at shooting guard (the lock there has a bronze corner badge for improved shooting, whereas the small forward iteration of the lock does not) and a shot-creating sharpshooter at small forward. That lock placement presupposes that scoring stems from the backcourt, which, with the addition of the shot-creating sharpshooter, is no longer a guarantee. Personnel thus becomes crucial. Do you slide the power forward into more of an on-ball defensive role? Which point guards can be trusted to shut down their opposites? Those are the questions that teams have to answer.